Enjoy discounted group rates plus other benefits when using one form of payment for a group with a minimum of 20 people. You bring the people, we’ll make ‘em happy! We have decades of experience making group memories here at Waterville Valley- whether it’s a group of coworkers, students, family members, sorority/fraternity members, ski club enthusiasts, or a bunch of friends- we have acres upon acres of terrain and a winter playground with something for everyone! Not only will we supply the fun, we’ll also offer incredibly discounted rates- savings up to 50%! It doesn’t stop there- for every 20 people you bring, we will reward you with comp tickets! Reservations are required at least 48 hours prior to your ski day to secure discounted rates and only one form of payment is accepted (ie: no individual transactions). We can customize your day as you wish- nothing is too big or too small! Hundreds of groups ranging in size from 20-500 have enjoyed bringing their outing to the next level at Waterville Valley! We specialize in ski club adventures! Exclusive ski club/ski council membership perks now include our awareness weekends- save up to 50% off lift tickets! Dates for 2019/20 season are TBD - present your current membership card at any ticket window to purchase a $45 lift ticket! We specialize in ski club adventures! Exclusive ski club/ski council membership perks include our awareness weekends- save up to 50% on tickets! Experience all that Waterville Valley has to offer by challenging members to a race, or kick back and enjoy your own private lounge- the Harpoon Skybox- for an unforgettable ski day! Save Money- Save up to $29 on our Learn-to-ski package and $25 off Lift Tickets! No up-front cost to your company- Payment will not be required until the end of the ski season and you only pay for the tickets you sold. Any unused tickets can be return at NO charge. Online option-Now you have the option to purchase discounted lift tickets online thru Waterville.com. This will eliminate the need to reconcile lift tickets at the end of the season. Promotional material provided- We’ll provide you with posters to help advertise around the office. We’ll also send condition reports through email for distribution. One ticket- Our tickets are for all ages, valid seven (7) days a week, including holidays at Waterville Valley Resort (rental equipment not included). These lift tickets are valid for employees, their families and friends. Your employees may use these lift tickets or exchange them for one of the following options listed below. 1. All-Mountain Lift Ticket: Valid 7 days a week through the 2019-2020 ski season. 2. Snowsports Lesson Option: Save even more when Any Day Lift Tickets are exchanged for a first-timer’s introduction to skiing or snowboarding package, which includes rental equipment, two-hour group lesson and a learning-area lift ticket. To exchange lift ticket for introduction packages, bearer must be 7 years or older at Waterville. The Harpoon Brewery Sky Box is the ideal solution for your next group getaway. Perfect for company outings, ski club outings, birthday parties, or large family vacations, the Sky Box offers the convenience and privacy of a luxury ski vacation. Relax in a private, slopeside suite, located just steps from the high-speed White Peaks Quad. With our all-inclusive packages, planning your next group getaway has never been easier. The Sky Box is equipped with overstuffed leather couches and recliners, fireplace, 2 flat screen TVs, WiFi, private bar, private bathroom/changing room with shower, and a large group dining table. Equipment rentals and ski/snowboard lessons are available at a discounted rate for Skybox groups. Engage and challenge your guests with a race! Complete with gates, timing and computerized results, you could win bragging rights in the office. Additional activities available for a nominal fee include Nordic skiing, snowshoeing, ice skating, tubing, and winter FAT biking. Don’t want the ski day to end? Contact us to arrange a private dinner, fireworks, sleigh rides and more! Take advantage of our multi-trip programs! Why book 1 when you can book 3! Book 3 trips to Waterville and pay only $35 per trip. This program is perfect for youth or schools groups. Waterville Valley specializes in group trips; let us show you how easy it is. Discounted rates are also available for lessons and rentals. If your group wants to plan five of more ski trips this winter then we have the program for you. Plan five trips to Waterville (plus a make-up date) and pay only $155 per person (ages 6-18). You choose which dates to ski or ride and we supply the fun. Also take advantage of our deeply discounted rental and lesson rates associated with this program. School group leaders still enjoy complementary lift tickets and, as a bonus of signing up 35 kids, we will supply you with your very own Waterville Season Pass, a value of $899. Waterville Valley is the perfect location for your scout weekend outing! Scouts ‘camp’ on the floor at the conference center located in the heart of the pedestrian village of Waterville Valley. One of our shuttle buses will transport your scouts to the ski resort during the day and there’s a multitude of evening activities within walking distance from the conference center: restaurants, shops, tubing, ice skating and more! After a great day on the slopes, scouts will enjoy a pizza party dinner, followed by tubing and FIREWORKS! Includes lodging for 2 nights, skiing for 2 days, movie room set-up on Friday and Saturday night, Tubing, and Fireworks Saturday night, Pizza Party Saturday, Lunch both days and breakfast both days. The price for this is $175 for Teens and $195 for Adults. If you need a 2 day rental add $66 (any age). A 2-hour lesson each day would be an extra $66. There is also a chaperone rate of $100 - one adult can use this rate for every 10 paid scouts. Includes lodging for 1 night, skiing for 1 day, movie room set-up on Friday or Saturday night, lunch and breakfast. The price for this is $95 for Teens and $100 for Adults. If you need a 1 day rental add $33 (any age). A 2-hour lesson would be an extra $33. There is also a chaperone rate of $50 - one adult can use this rate for every 10 paid scouts. Located amidst 700,000 acres of White Mountain national forest, Waterville Valley is the ideal location to host your families’ next gathering. With our Freedom Pass package offering 9 different activities, you can rest assure that there will be something for everyone! Grab a mountain bike and cruise over 30 miles of marked terrain or slip into a kayak and paddle around Corcoran’s pond- with our Summer Unlimited package you can do it all! We're right in the middle of the 770,000 acre White Mountain National Forest where you'll find endless hiking trails, world-class trout fishing, skate park and camps, Corcoran Pond and beach, and abundant gorgeous mountain panoramas. Waterville Valley offers a wide variety of lodging options from country inns to four bedroom town houses. All lodges are located conveniently to all area attractions and the free trolley can take you where ever you need to go. Waterville can customize any meals your during your stay. Whether it is an outdoor BBQ or four course meal we can cater your next gathering. 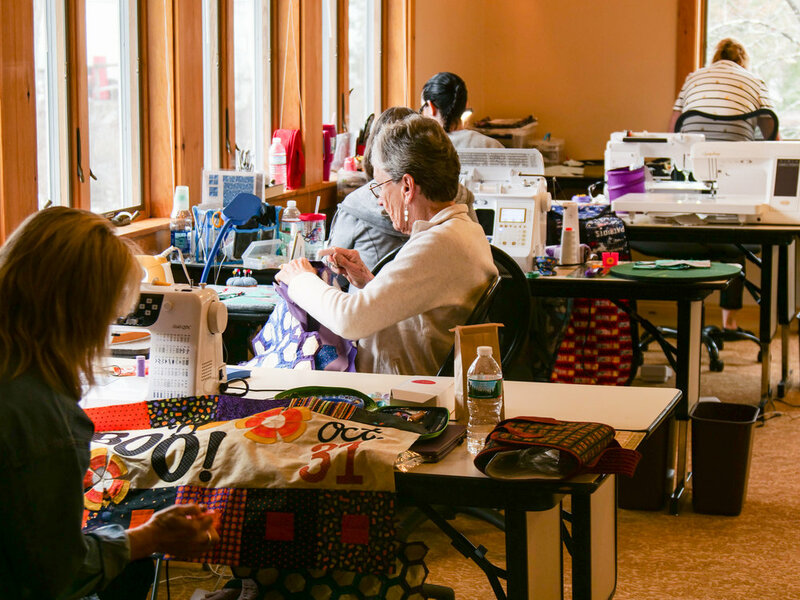 Join the weekend quilters, better known as “Quilters Gone Wild” at the Silver Fox Inn for a relaxing weekend of quilting, dining, and enjoying wine with friends. Each participant will have their own work station. Weekend rates start at just $180 per person and include lodging for Friday and Saturday night (based on double occupancy, breakfast, lunch, and dinners. The rate includes all taxes and service charges. Group minimum is 10 people. Add $100 for single occupancy rooms. Contact Conrad @ 1-888-467-5498 for more information.